Two layers of polyethylene over class III galvanized steel wire. Perfect for underground use and to connect fence charger to fence. Designed for direct burial. Withstands 20,000 volts. Double insulated. 14 GA Galv. 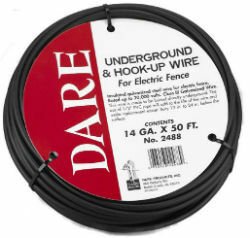 core wire x 50 ft.